CTMF 2019 will focus on the outlook, key trends and issues impacting raising capital in global mining today - and highlight solutions, risks and opportunities. Speakers will discuss case studies and talk about how management and investors use best practices and technology to anticipate, track, manage and reduce technical and non-technical risk, including environmental, political and financial risk. There will also be multiple panel discussions about market trends and issues impacting deals being done, as well as panels addressing rapid, pivotal changes impacting financing projects and opportunities today. The dual track agenda provides all attending a choice of which experts they want to hear. See the agenda here and speakers' bios here There will be more updates announced soon. Hear and meet these key note speakers and many other influential leaders in our sector who work around the world! Government of Quebec's Mr. Pierre Fitzgibbon, Minister of Economy and Innovation and Minister Responsible for the Lanaudière Region discuss "What makes operating and investing in Quebec's mineral rich province attractive". Ross Bhappu, Partner, Head of Private Equity Funds at Resource Capital Funds discuss "Where are the Public Markets for Mining? And how do we get them back?" The event format encourages all to meet and ask questions of experts from around the world, with many leading companies who are working to fund projects, drive down cost, use innovative means to manage and reduce risk and add value. 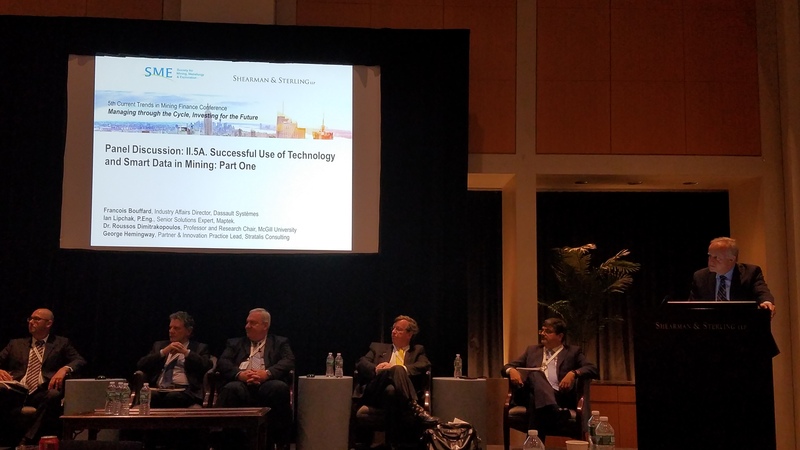 Bankers’ View of Capital Markets and Mine Financing - multiple round tables about recent deals, M&A, restructurings, where, how and who is raising capital, what issues are most prominent in investors' minds. Evaluating, Structuring Finance and Funding of Mining Companies and Projects including discussion of alternative capital sources, royalties, streaming, debt, project finance, pre-payments, and off take agreements. Register to get your questions answered at the conference, five workshops and or three receptions. Space is limited*. Share this announcement about CTMF 2019 with others. 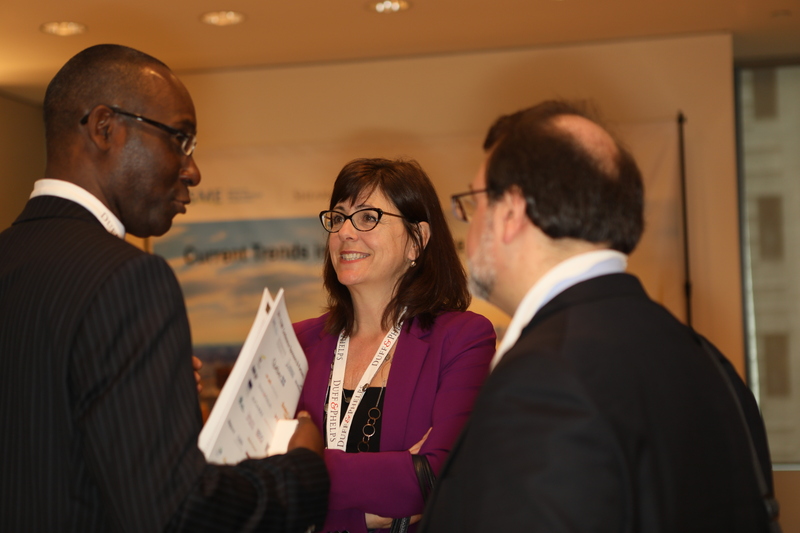 Throughout CTMF 2019 there will be time to meet one-on-one with influential banking, finance industry executives and many leading advisers interpreting and presenting technical and non-technical data supporting analysis and financing of all types of mining projects, ranging from sand and gravel, industrial minerals to base, precious and critical minerals and bulk mineral commodities, working all around the world. Meet senior officers from these banking, investing, private equity, and engineering and professional advisory firms that as of early April include executives from more than 40 mining and exploration companies as well as officials from numerous government agencies operating in and representing many countries from around the world. You do not have to attend the conference to attend any of two workshops on Sunday April 28 and or three workshops on Wednesday May 1 - and the three receptions on Sunday April 28, Monday April 29 and Tuesday April 30. Hear Key Note Speaker Ross Bhappu, Partner, Head Partner of Private Equity Funds from Resource Capital Funds speak about "Where are the Public Markets for Mining? And how do we get them back?" Ross will present his view of the mining sector that in recent years has not been of interest to 'generalist' investors because the industry has recently been poor at generating good returns for investors. Ross will discuss recent trends and data about money leaving the sector and investor sentiment about the sector being anemic, at best. He will also explain what needs to be done to turn the ship and demonstrate that the mining industry can be a good sector in which to invest. Established in 1998, Resource Capital Funds (RCF) pioneered the concept of a mining-focused private equity fund. RCF is a specialist in mining and partners with companies to build strong, successful and sustainable businesses that strive to produce superior returns for all stakeholders. RCF’s management team consists of individuals with extensive commercial and technical experience in the mining industry. Ross Bhappu has been with RCF since the beginning of its second fund in 2001. His experience in the mining industry includes working for both major and junior mining companies in operational, business development and management roles. Prior to joining RCF, Ross served as the CEO of a development stage mining company. Additional experience includes serving as Director of Business Development for Newmont Mining Corp. and various technical and commercial roles for Cyprus Minerals Co. (now part of Freeport-McMoRan Copper & Gold) where was involved in the construction and operation of the rebuilt Miami Copper Smelter in Arizona. Ross currently serves on the boards of directors of portfolio company Lighthouse Resources Inc. and the Lowell Institute for Mineral Resources. He previously held Director roles with a number of mining companies including Traxys S.A., Molycorp, Constellation Copper, EMED Mining and Anglo Asian Mining. Ross recently concluded his three-year term on the board of directors of SME. Ross holds a Ph.D. in Mineral Economics from the Colorado School of Mines and B.S. and M.S. degrees in Metallurgical Engineering from the University of Arizona. Meet with members of Quebec's delegation of mining executives and officials returning to CTMF now for the fourth year as well as meet and hear the Government of Quebec's Mr. Pierre Fitzgibbon, Minister of Economy and Innovation and Minister Responsible for the Lanaudière Region speak about "What makes operating and investing in Quebec's mineral rich province attractive". In 2017, the mining sector made $ 3.05 billion in investments for Québec. The mining sector has nearly 30,000 direct and indirect jobs. The supplier and supplier network alone accounts for 3,950 Québec companies. Mineral production is diversified: 29 substances exploited (15 metals and 14 non-metallic minerals). There are 25 active mines and nearly 26 mining projects. Pierre Fitzgibbon was born in Montréal. He holds a Bachelor’s Degree in Business Management from École des Hautes Études Commerciales de Montréal (HEC) and is a Quebec Chartered Professional Accountant. Before becoming involved in politics, Mr. Fitzgibbon served as managing partner at Walter Capital Partners, a private Equity Firm, between 2015 and 2018. From 2007 to 2014, Mr. Fitzgibbon assumed the role of president and chief executive officer at Atrium Innovations, a company that develops, manufactures and markets value added products for the health and nutrition industry. From 2002 to 2007, he put his skills to work at National Bank Group, where he occupied the position of vice-chairman of National Bank Financial, where he mainly acted as head of investment banking and corporate finance services. He was also senior vice president of finance, technology and corporate affairs at National Bank of Canada. Previously, Mr. Fitzgibbon also held executive positions in finance, as well as in company and business development at Télésystème Mobiles International, Chase Capital Partners Hong Kong, Domtar and Peerless Carpet Corporation. He began his career at PricewaterhouseCoopers in auditing and consulting services. Over the last few years, Mr. Fitzgibbon has served on several boards of directors, including that of Caisse de dépôt et placement du Québec, WSP, Héroux-Devtek, TC Transcontinental, Cycle Capital Management, Neptune Technologies, Lumenpulse and Arianne Phosphate. This committed businessman is involved in his community and in several organizations, including until recently, the Fondation du Dr Julien. We hope you join us at CTMF 2019 - an event that combines a content-rich agenda with many leading practitioners and experts - who travel to New York from as many 21+ countries - who are involved with funding and advising mining projects around the world in a setting facilitating all to meet and talk with one another sharing the latest ideas, thinking and trends impacting the financing of mining projects world wide. In addition there are five informative workshops here that you can register to attend. You do not have to attend the conference. III. Valuing Mineral Assets and Operations led by Alan K. Stagg, PG, CMA is President & CEO of Stagg Resource Consultants, Inc. Throughout CTMF 2019 there will be time to meet one-on-one with many key influential banking, finance and industry executives and advisers working around the world. Visit Why Attend where there is a list of the many companies that attended CTMF last year in three categories: banking, finance, investor, private equity firms; and mining and exploration firms and professional advisory firms. At CTMF 2018 last year were more than 290 leading experts and senior executives including officers from more than 42 mining and exploration companies and bankers, investors, private equity, analysts, advisers, engineers, and officials from Australia, Canada, Germany, Mexico, Quebec. Delegates attending were from more than 21 countries including Argentina, Australia, Bolivia, Brazil, Canada, Chile, China, Colombia, Germany, Ghana, India, Japan, Kosovo, Mexico, Peru, Portugal, South Africa, Spain, Turkey, the United Kingdom and Uruguay. Titles of attendees include: CEO, President, Partner, Executive Director, Project Manager, Banker, VP, Engineering & Development, Corporate Finance Specialist, CFO, Treasurer, Consultant, Managing Director, Geologist, Corporate Strategist, Investor, Environmental Specialist, Engineer, Mining Engineer, Lawyer, Financial and Equity Analyst, Accountant, Portfolio Manager, Controller, CTO - Chief Technology Officer, Global Leaders of Mining and Natural Resources, Founder and Community Engagement, Economic Geologist, Investor Relations Officer and Appraiser. * Space is limited. The organizers are monitoring registrations periodically and may need to close registration. Registration closed early in 2018 and 2017. We may require some registered delegates to be present in a second board conference room that will have live video and audio feed to the main conference or conference room G/H and or attend in a third board room to watch and hear via live audio/video feed. Additional rooms and space adjacent to the main conference room are places to relax, network, meet one on one, for quiet phone conversations, or work. NY SME is organizer of the 7th annual CTMF conference. It is a section of Society for Mining, Metallurgy & Exploration, an association of 14,000+ geo-scientists and mining, mineral professionals in 100+ countries. SME members include mining executives, engineers, geologists, metallurgists, educators, students and researchers. SME advances the worldwide mining and underground construction community through information exchange and professional development. SME is a member society of the American Institute of Mining, Metallurgical and Petroleum Engineers. The New York Section of SME encompasses the Tri-State area. Its members are given the opportunity to network with peers and hear valuable presentations through its activities. NY SME dates back to 1871 when a handful of mining engineers in New York City founded the American Institute of Mining, Metallurgical and Petroleum Engineers (AIME). We encourage all to visit the SME's Bookstore Catalog tab herein for a number of excellent, informative economic, business texts about mining.